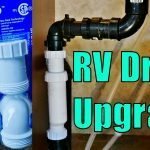 You may remember last year I gave the Waste Master RV Sewer System a full Love Your RV review. I was very impressed with the design and quality of the hose and connections. In the last year, it hasn’t failed to live up to my high expectations. The only major beef I had with the sewer hose was the permanently attached 90-degree head, storage was an issue. It would not easily slide into the rear bumper like my old hose did. I ended up building a custom carrier for it mounted on top of the bumper. This arrangement worked well enough however I’ve since come to realize there may be a much better solution. 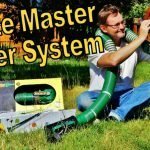 Soon after my review was published I was contacted by Doug Swarts of DrainMaster.com. He is a long time RVer and the designer of the Waste Master Sewer System. Doug informed me he envisioned the sewer hose to be always hooked to the RV. Therefore it would be unnecessary to decouple it between campsites. No more dribbling stinky slinky to deal with when breaking camp. 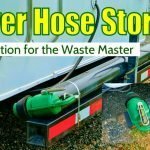 The Waste Master hose would live in its own storage box or sleeve. 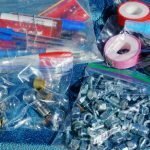 I was intrigued and accepted his invitation to drop by the Drain Master shop in Hollister, California for a look at a prototype storage solution he was working on. He explained how the parts would hook up underneath my Cougar fifth wheel and asked if I would like to give the mod a try. Of course, I would! The plan was to mount an LCI (Lippert Components Inc.) plastic storage box about where the existing sewer output point was on my 2011 Keystone Cougar trailer. The LCI box is uniquely sized to store the Waste Master Sewer Hose with just one 180 degrees coil required. 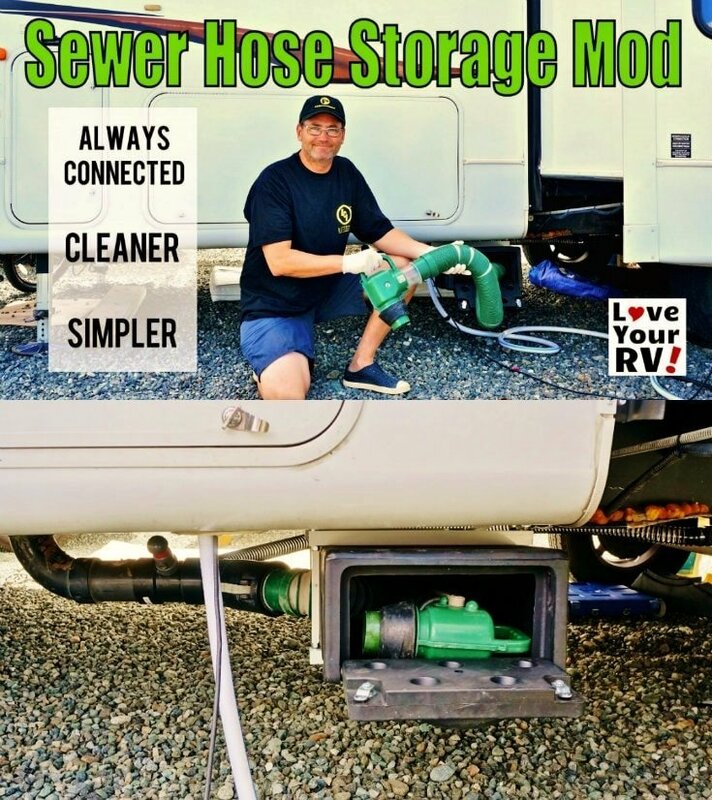 A hole would be cut in the side of the plastic box and the sewer hose would be connected to the RV’s main sewer output via its cam lock connector. 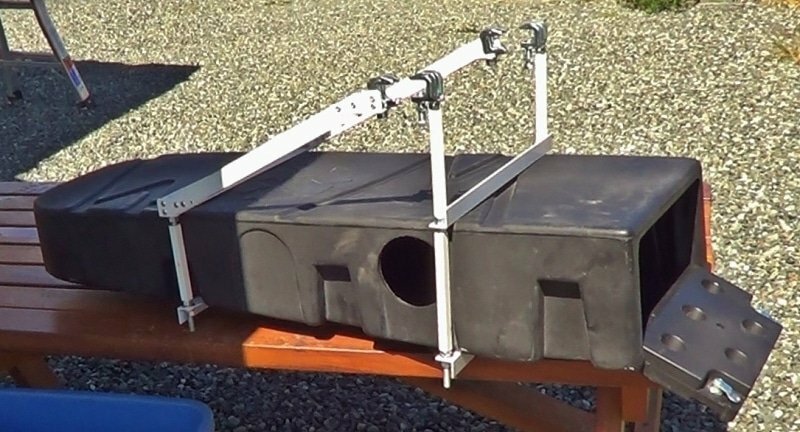 To secure the storage box I would use a set of prototype metal brackets supplied by Drain Master designed to bolt onto the trailers steel I-Beam frame rail. I wanted the box located as close to the rear wheels as possible for best ground clearance but not under our slide out room. So, I picked my mounting location as close to the slide out as practical. Everything seemed really easy until I took a gander under the Cougar. I instantly remembered the second drain pipe teeing into the main sewer drain from our RV galley tank. It’s located to the rear of the trailer meaning it would have to cross over the new storage box. I wanted the box sitting up snug to the Cougars belly for maximum ground clearance so routing the pipe over was a no go. Especially, if I wanted to maintain a downward drainage angle. I decided to reroute the 1 1/2 inch galley drain pipe around the back of the box. This, of course, created another issue. It would make removing the coroplast underbelly covering a complete pain since the other side is covered with the propane piping. Given my history of upgrades/mods and for future repairs I knew easy access to the guts of the beast is a must. 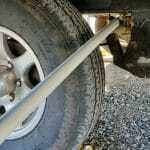 The solution I came up with was to use a piece of heavy duty flexible marine drain pipe used for large boat bilges. Each end would be held in place by a hose clamp allowing for quick removal and reinstallation. The first thing I did was unscrew and cut a large section of the coroplast board underbelly out. I wanted plenty of room to work with. 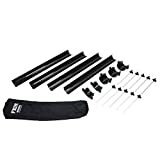 It would be re-screwed in place after the work was done and any seams sealed with 2.88″ wide Gorilla tape. If you saw my blog post detailing my HepvO valve install you know plumbing is not my forte but I was still game, out came the hacksaw. I cut the main drain back enough to add on a new tee section and the Waste Master female cam lock. Then I crawled under the rig and cut off the galley drain a foot or so before it disappears into the underbelly. Next, I mounted the box by bolting it to the trailers I-beam frame rail. To secure it in place, even more, I ran a piece of plumber strap from an internal horizontal frame rail to the boxes rear support bracket. To the same rail, I added a hanger for the flex hose as it made its way behind the box. I then secured another hanger on another frame rail nearer to the galley tank output. Finally, I attached both ends of the flexible hose using hose clamps. 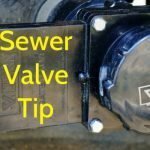 The check valve should be installed vertically above the pipe for best operation. I messed up and forgot to install it before the pipe was glued on. Doh! Leaving myself insufficient space to drill the hole. I had to install the check valve on an angle. I ran into another snag when I went to line up the newly attached female cam lock to the male end of the Waster Master hose. The design Doug showed me had the hose entering the box perpendicularly. This allows the rugged plastic collar of the hose end to be against the plastic edges of the entrance hole and the cam lock levers to function properly. Unfortunately, since I had previously cemented the female cam lock close to an ABS elbow I was going to be entering the box at an angle. It’s always fun trying to custom build something, isn’t it? But at least others get to learn from my mistakes. 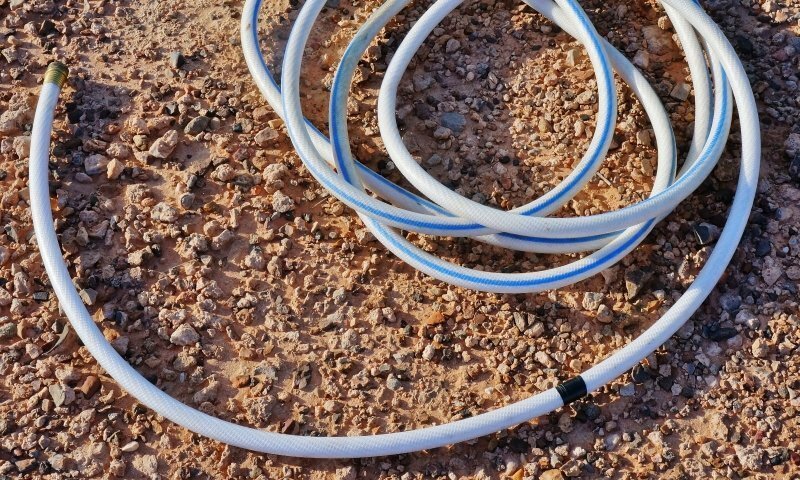 As soon as I can get hold of a new female cam lock connection I’ll correct these errors by redoing the plumbing between the rigs main sewer output and the hose storage box. I have to say this mod is a great success. Why the heck don’t RVs come this way? Now when it’s time to dump the waste tanks it’s a breeze. Even my squeamish wife Anne will want to partake in the dumping duties. Well, maybe not, haha. But at least if I’m away and she *really* has to do the deed it won’t be such a nasty task. Now, we just open up the new sewer hose storage box. Pull out the Waste Master nozzle and stick it in the sewer hole. Then flip open the valves and let her rip. Once the job is done, close the valves and place the hose back in its box. No muss no fuss. It’s so much more sanitary compared to what we have traditionally been offered by the RV manufacturers. It’s about time we RVers demand they improve this part of RVing.